There are less than 2000 oceanfront parcels on the island of Oahu, so it goes without saying that there is a limited supply of this coveted category of property. I specialize in Oceanfront property, and do so because I love the ocean and the beach lifestyle. CLICK HERE to see all Oahu Ocean Front properties currently on the market. Oceanfront properties for sale on Oahu have special requirements and unique circumstances such as shoreline surveys, Oceanfront building setbacks, composition of the ocean frontage, swimmability, flood zone ramifications, special managent areas, presence of outer reefs, and beach accretion and avulsion (some places on Oahu are rocky during the winter and sandy during the summer). I can help you find a property that best suits your lifestyle, taste, and budget. Are the waters swimmable in front of a specific property? Is the frontage (and therefore ocean access) rocky, sharp lava, or sandy beach? How big of a boat can navigate to a specific canalfront or marinafront property? Which oceanfront houses have a consistent surf spot fronting them? I know all of the surf spots on the island intimately and can tell you which ones are for professionals and which ones are mellow and unlocalized. Oahu has hundreds of surf spots, and although many are crowded, there are still many spots that are semi-secret, require boat access, or are off the beaten path. Having grown up with a surfing father and in a family that regularly spent time at the beach, boating, sailing, diving and fishing shaped who I am today, and what I love and prioritize in my free time. I try to share this passion and knowledge with all of my clients. Understanding the nuances of oceanfront property on Oahu is not something most real estate agents have specific training or knowledge in. One gets this information from spending a lot of time exploring the island's coastal waters and beaches, and by successfully selling waterfront property. These are two things in which I have thorough experience. I have represented many Oceanfront and Beachfront buyers and sellers on Oahu, and have spent much of my free time paddling, boating, surfing, and walking the coastlines of Oahu. This is the core reason why this website is dedicated to Coastal property - I love helping my clients find the perfect coastal property, and enjoy sharing my wealth of knowledge. This is really a subcategory of Oceanfront (Beachfront properties are classified as Oceanfront, but not necessarily vice versa), and as the name suggests, has sandy beach frontage. Swimming is usually easier from 'Beachfront' properties, but there is no substitute for a realtor familiar with the different oceanfront areas on Oahu. Some areas will be swimmable year round, while other locations may have a seasonality component to the ease of ocean access. The Honolulu Board of Realtors maintains the whole island of Oahu's MLS (AKA Hicentral MLS), and has multiple categories that realtors can use to describe their listing's property frontage; Beachfront is one of these categories. There are by nature less Beachfont properties on Oahu than Oceanfront properties, and therefore typically Beachfront properties command a higher valuation than Oceanfront properties in the same area. However due to the unique features of one area versus another, value is localized. This is why it is important you consult an expert on the market. Distance from a public access point and difficulty of public access is another important determinant of value in this coveted category of property, as the further a property is from the public access way, the less crowded and more valuable a location will usually be. 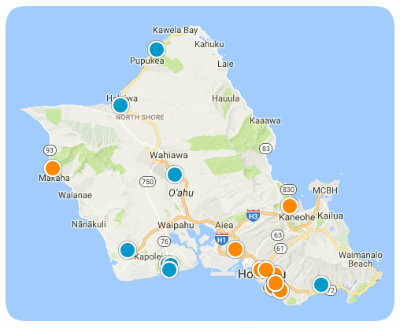 Some of the most desirable Beachfront areas on Oahu are Diamond Head, Kahala, Kailua, Beachside, Lanikai, Sunset Beach, Kawailoa, Mokuleia, Waimanalo, and Hawaii Kai. CLICK HERE to see all Oahu Beachfront properties currently on the market. Oceanfront is the broader definition of the two types of ocean frontage, as all Beachfront properties are Oceanfront. If a property is categorized in the MLS as Oceanfront but not Beachfront (the MLS allows multiple categories to be selected for property frontage), then most likely it has rocky, lava, or coral beach frontage. As explained earlier that sandy frontage is usually more valuable, rocky frontage does have its advantages. This is because the shoreline is considered public property in Hawaii, and therefore there are no 'private' coastlines. Some areas are more difficult to reach by public access, and therefore feel more private than others. The main advantages that rocky or lava ocean frontage has over sandy frontage is that there is usually less public use and therefore more privacy. The best and most well known of the sandy beaches on the island (Waikiki is an apparent example) are famous for their beauty and splendor, and therefore the properties fronting them tend to have less privacy than locations that have lava and rocky frontage where people are less inclined to enjoy a day on the coast. An additional fact to point out is that it may very difficult to enter the ocean from some rocky or lava frontage properties, while others can be fairly easy for an able bodied individual.